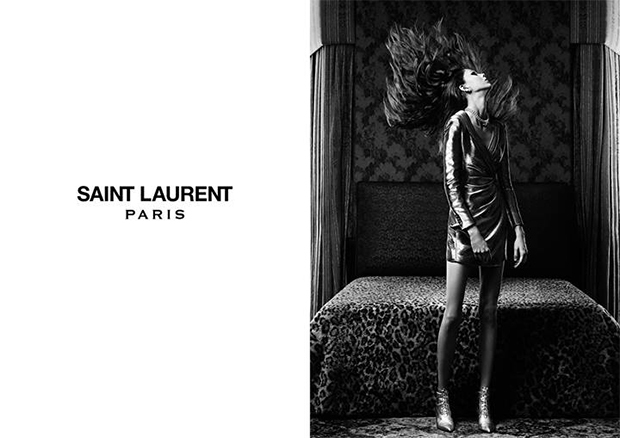 Saint Laurent dropped a stunning Spring 2014 campaign early this morning. A few standalone print images were posted across the brand's social media, but the star attraction is a beautiful triple-frame scrolling video gallery of stills. You can only see it on YSL.com (screenshot below). Photographed by designer Hedi Slimane himself in Los Angeles and starring models Natalie Westling, Nastya Sten and Jeff Fribourg, the campaign has the same disaffected, rebellious mood and dark, druggy look on display in the designer's previous ad work for the French fashion label. In the campaign video, the fragmented moving pictures are accompanied by the song, "Teenage Girl," from LA-based cool kid band Cherry Glazerr (embedded below). 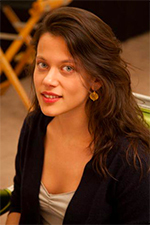 The song first gained popularity when it was posted on Tavi Gevinson's RookieMag last year. It shares the publication's sweetly subversive alterna-girl vibe, combining witty, blissed-out lyrics (Sneaking cigarettes at lunchtime / Sun feels safe and sublime / Pink sparkly sunglasses lying by the pool / Rob Kardashian's a tool) with a trippy, dreamlike sound. This is the second-time the designer has chosen to soundtrack a brand video with music by Cherry Glazerr. For Slimane's Saint Laurent directorial debut in September, the designer tapped lead singer Clementine Creevy to create an original composition for a lovely dance movie starring Lida Fox. The singer also appeared in the front row at the label's Spring 2014 runway show in Paris this October. In the tFS Forums, the early response has been positive. 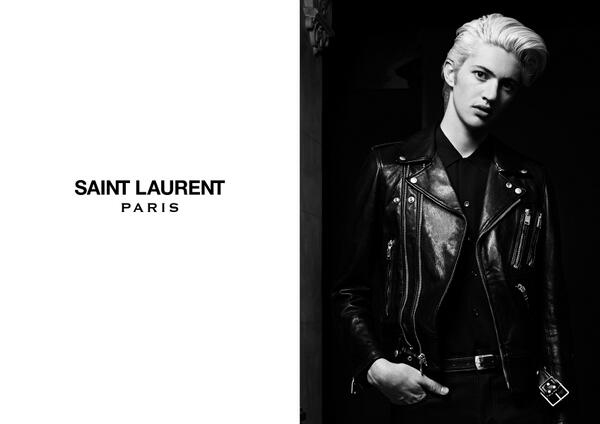 One commenter called it Slimane's best Saint Laurent campaign to date, and I agree. But on the brand's Facebook page, some users are asking why the models pictured are so frighteningly thin. On the question of model casting and sizing, Slimane has been consistent: At Dior Homme in the 2000s, Slimane's work changed the body standard for men, making it chic for guys to be super-slim — Karl Lagerfeld famously lost 90 pounds so he could fit into one of Slimane's suits. The designer hasn't changed his approach for Saint Laurent. Reviewing the Spring 2014 menswear show for Style.com, Tim Blanks characterized the models as "wasp-waisted, shrunken-chested boy band members." Slimane's September dance film, starring Lida Fox, was also striking for the her straight, narrow frame, emphasized by the fact that she was styled in tight leather pants and a tiny bandeau top. (Also, most of his models are white. Thought it was worth mentioning.) Just because he's consistent doesn't make his choices any less disturbing. The song playing over the video might be called "Teenage Girl," but his customers are adult women. Slimane is doing the classic fashion thing: Selling teen culture and the idea of youth to adult women at exhorbitant prices. He's doing a fantastic job of it (the selling part), but that doesn't mean it's not profoundly messed up.